Direct infusion mass spectrometry (DIMS)-based untargeted metabolomics measures many hundreds of metabolites in a single experiment. While every effort is made to reduce within-experiment analytical variation in untargeted metabolomics, unavoidable sources of measurement error are introduced. This is particularly true for large-scale multi-batch experiments, necessitating the development of robust workflows that minimise batch-to-batch variation. Here, we conducted a purpose-designed, eight-batch DIMS metabolomics study using nanoelectrospray (nESI) Fourier transform ion cyclotron resonance mass spectrometric analyses of mammalian heart extracts. First, we characterised the intrinsic analytical variation of this approach to determine whether our existing workflows are fit for purpose when applied to a multi-batch investigation. Batch-to-batch variation was readily observed across the 7-day experiment, both in terms of its absolute measurement using quality control (QC) and biological replicate samples, as well as its adverse impact on our ability to discover significant metabolic information within the data. Subsequently, we developed and implemented a computational workflow that includes total-ion-current filtering, QC-robust spline batch correction and spectral cleaning, and provide conclusive evidence that this workflow reduces analytical variation and increases the proportion of significant peaks. We report an overall analytical precision of 15.9 %, measured as the median relative standard deviation (RSD) for the technical replicates of the biological samples, across eight batches and 7 days of measurements. When compared against the FDA guidelines for biomarker studies, which specify an RSD of <20 % as an acceptable level of precision, we conclude that our new workflows are fit for purpose for large-scale, high-throughput nESI DIMS metabolomics studies. 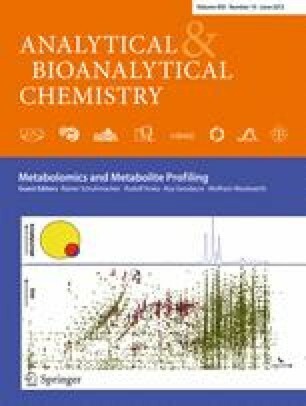 Published in the topical collection Metabolomics and Metabolite Profiling with guest editors Rainer Schuhmacher, Rudolf Krska, Roy Goodacre, and Wolfram Weckwerth. J. A. Kirwan and D. I. Broadhurst contributed equally to this work. The online version of this article (doi: 10.1007/s00216-013-6856-7) contains supplementary material, which is available to authorized users. An erratum to this article is available at http://dx.doi.org/10.1007/s00216-014-8047-6. This work was in part supported by the UK Natural Environmental Research Council (NERC) Biomolecular Analysis Facility at the University of Birmingham (R8-H10-61) and by the British Heart Foundation. The FT-ICR used in this research was obtained through the Birmingham Science City Translational Medicine: Experimental Medicine Network of Excellence project, with support from Advantage West Midlands (AWM). David Broadhurst holds salary support from Pfizer Canada. We thank Leansale Ltd. Abattoir, Birmingham, for donating the hearts and Tristan Payne for providing MATLAB programming support.